So you have decided to get in better shape and you have decided you want to buy a treadmill. With so many different models and price points, how do you know which one to get? If you are going to be using the treadmill on a regular basis, maybe three or four times a week, then you want to make sure that you get a good quality machine. Spending a little more money will save you money in the long run because you won’t have to replace in a short amount of time and you won’t have to spend money on repairs. The less expensive machines tend to have smaller motors and won’t be able to power a full-sized treadmill. They generally have lots of plastic pieces that can break and they are generally not as stable as the better quality machines. In buying a good quality treadmill you will want one where the motor is rated with continuous duty horsepower. This kind of motor actually will measure the horsepower that is being delivered during your workout. This is a commercial grade that most health clubs and good quality treadmills for the home will have. These motors are also more powerful and they will last longer. Another benefit of this kind of motor is that you will get a smoother ride meaning you won’t be slipping when you run or walk on the machine. You will also want to look for bigger rollers. They will have a longer belt which will give you a better experience on the treadmill. Remember to look at the warranty. The longer the warranty generally means the better the treadmill. When buying a treadmill is very important to check out the stability of the machine. Test out the machine by getting on it and start walking or running to make sure it doesn’t rock back and forth or shake. Some treadmills come with reversible decks which means when the running surface on one side wears down you can flip it over and use the other side. Two decks for the price of one! When it comes to programs, less is more. You are probably not going to use more than three or four of the programs. It should have heart rate training, a clock, distance run and calories burned. If you want other programs such as hills, then you might want to consider models with more programs. 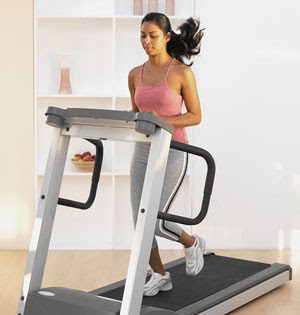 Being able to set the speed and incline will be important options to have on your treadmill as well. If you aren’t going to be doing a lot of hill training then the incline feature might not be important for you. One last feature to take notice of is the shock absorption of the machine. You don’t want the deck to be bouncy when you are walking or running on it. Also, you don’t want it to feel like you are running on a hard surface either. Look for a deck that feels comfortable for you when using it. There are a number of extras you can get with treadmills including cup holders and magazine racks. If these are important to you then you might want to consider a machine that has them. The last piece to take into consideration is the price. There are great treadmills that don’t cost an arm and a leg but you will still be paying several hundreds of dollars for a good quality machine. All you need to do is find the one that best suits your needs and that you can afford.